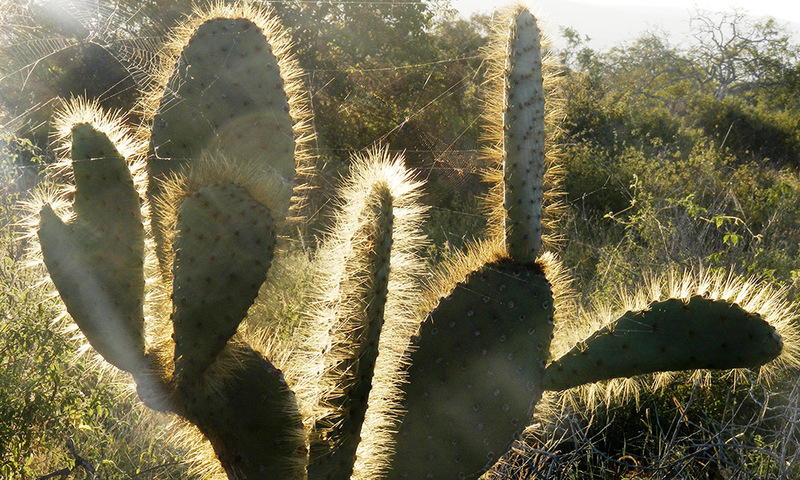 This large endemic species of cactus gets its name from its distinctive shape which resembles a candle holder. One of Galapagos’ endemic cactus species, the candelabra cactus gets its name from the shape of its ‘arms’ which give it the appearance of a candle holder. Less of a pioneer species than the lava cactus, the candelabra is found in the arid zones of islands where it can survive with very little water. Previously thought to have been three separate species, it is now understood that there are three subspecies of candelabra, each of which has a slightly different range and appearance. Fruits vary in colour among subspecies, ranging from red to green to purple, and provide food for many animals including finches and mockingbirds as well as land iguanas once they have ripened and fallen to the ground. Finches and lava lizards are also known to eat the flowers, which only appear in the early morning. When a candelabra cactus dies its ‘skeleton’ sometimes remains intact and becomes a nest for birds and other small animals. Where to see them: Found mainly in the arid zone across Bartolome, Fernandina, Floreana, Isabela, San Cristobal, Santa Cruz and Santiago. They are found from sea level to 1000m altitude. When to see them: Throughout the year but flowering takes place between December and June. Flowers are only visible for a few hours around dawn. Threats: Candelabra were previously affected by introduced goats which once roamed vast areas of the National Park, however eradication programmes have proved highly successful and they are no longer a threat. The goats have been removed and while the regeneration of cacti is slow the biggest threat to their survival has been removed. 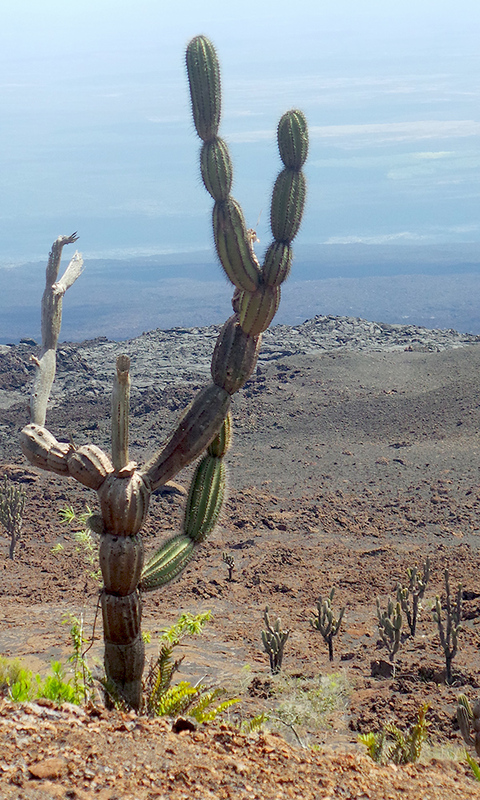 Conservation actions: Currently there are no specific conservation programmes for the candelabra cactus though they are protected as part of the Galapagos National Park. 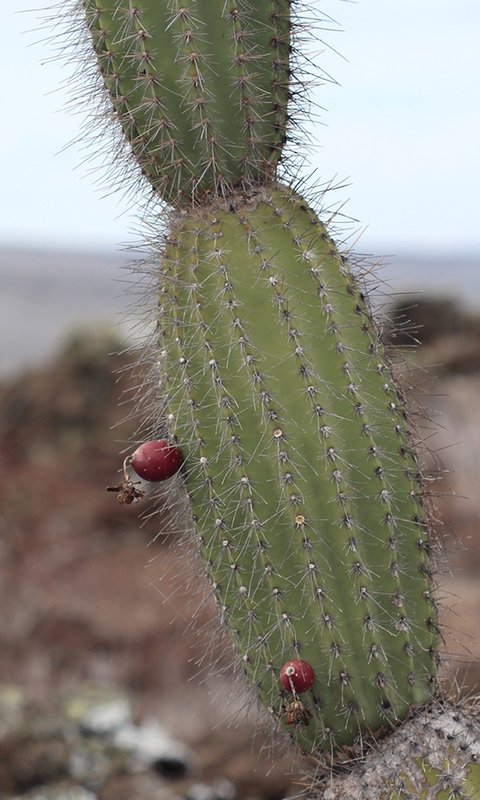 Learn more about Galapagos' endemic cactus species.